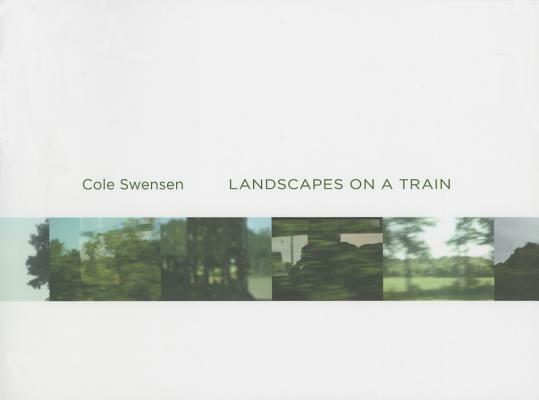 Influenced by the history of landscape painting, Cole Swensen's new book is an experiment in seriality, in the different approach and scope that language must take to record the way that fluctuations of minutiae transform a whole. These poems meditate on what it is simply to look at the world, without judgment, without intervention, without appropriation. Swensen's lyric observations, lilting and delicate, distill the act of seeing. "Swensen's poetry documents a penetrating 'intellectus'--light of the mind--by turns fragile, incandescent, transcendent." --Anne Waldman. COLE SWENSEN is the author of 13 books of poetry, including Gravesend, and a book of essays, Noise That Stays Noise. She's also the co-editor of the 2009 Norton anthology American Hybrid and the founder and editor of La Presse, a nano-press dedicated to contemporary French work in translation. She is professor of Literary Arts at Brown University.